The wife says we should be getting our “economic stimulus” check from Uncle Sam just about any day and has been day dreaming about what we should spend it on. Last night we surfed a few web sites and did a little shopping to make up a wish list and budget our anticipated money. One site that I particularly liked was 1-800-4clocks which is all about clocks, especially grandfather clocks. I never realized there were so many different kinds of grandfather clocks and so many different things to consider before purchasing one. First of all, there is the clock maker to consider. The long established and top brand names include Howard Miller, Hermle, Seth Thomas and Bulova. Of course there are others, but those are the ones that I recognized right off and the ones that I focused on shopping. Then you have to choose the clock cabinet style and type of wood finish or metal color. Then there is the clock face to consider and you also choose the chimes. On the 1-800-4clocks website they have a little button that lets you listen to samples of the different chimes. That is a nice feature, because I wouldn’t otherwise know the difference between the different ones, although once you hear them you think, “Oh! Of Course!” because you do recognize them after hearing them. The website even has a blog that is a collection of short articles relevant to grandfather clocks. I read the post titled, “Grandfather Clocks Help Define Decor” and knew right away that we should go ahead and make buying our new grandfather clock a priority, and it appears the wife agrees! This is pretty freaky. Last Friday we were just talking about George Carlin. His name came up at the convenience store while standing in line, and then we talked about him on the ride home. A few years ago we went to a performance he did here at the Ryman Auditorium. We scored the most excellent seats, second row, just slightly off center stage, thanks to my friend at the radio station. We “won” them. 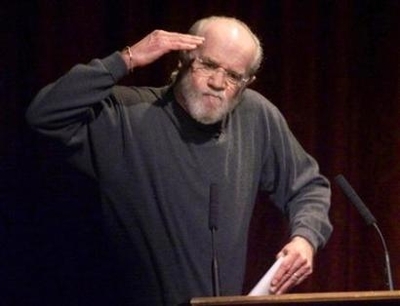 Anways, just as I was heading to bed I heard the talking head on the local news mention that George Carlin has passed away. Another shocker for the weeked – we figured George was so nasty and incorrigible that he’s be around for another 20 years. But it turns out that his heart gave out and he died in L.A., the Land of Angels. So, good-bye, George – thanks for the years of laughter at your observations and your jokes. I grew up listening to your sarcasm and jokes pointed at our boomer generation. We’ll miss you.